In this post you will learn how to can milk. 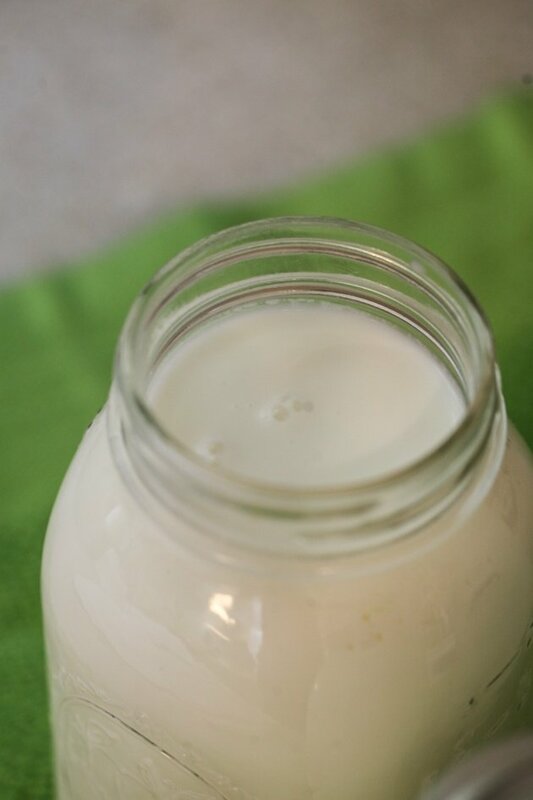 It can be raw milk or store-bought milk, cow’s milk or goat’s milk… They are all done the same. 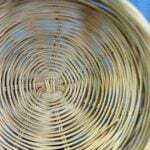 I have this fascination with old ways of doing things… If it’s how to tan a deer hide or weaving a basket or preserving food, I always find myself wondering how people did things before modern amenities. Often when milk from my goats starts to pile up in the fridge I make cheese. 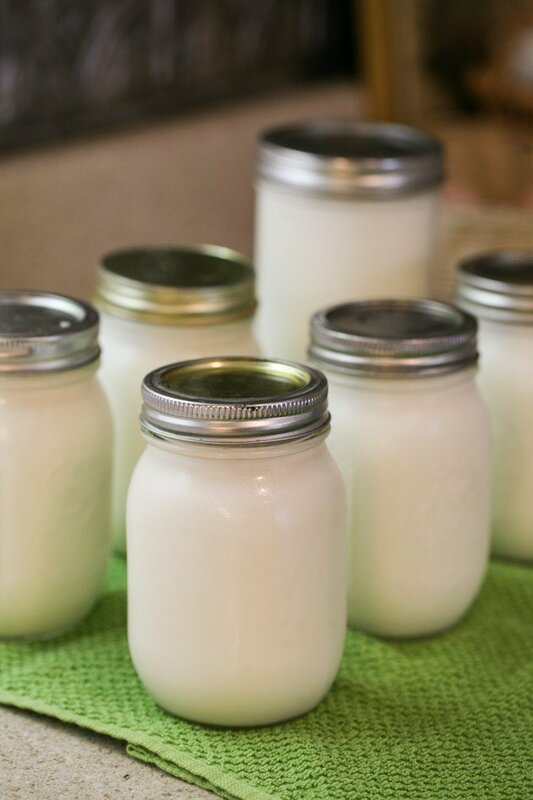 I usually make feta or chevre or yogurt or my favorite; this easy raw milk goat cheese… But all those need refrigeration or to be frozen if I want to keep them for a while. I did some research and I found that indeed I can can my milk! Well, you’ll have to do the research and decide for yourself. It’s kind of like drinking raw milk, the debate is heated and opinions are very different. I personally side with grandma most of the time with all due respect to modern research. I drink raw milk and I also decided to try and can it. It’s a personal decision and, again, you’ll have to research and decide for yourself if you want to do it or not. Feel free to voice your opinion in the comments below or share your experience, just please keep it respectful. I will say that though… Milk is a low-acid food. From my research, I found that there are communities around the world that can milk (and meat) in a water bath canner. Some of them are very close to us like the Amish, for example. However, to kill bacteria they must keep a steady temperature for 3 hours or so. It is very labor intensive in my opinion and still, the risk for Botulism (a bacteria that can grow in air-tight containers but is killed by high temperatures) is real, so I decided to use my pressure canner to can my milk. I recommend you use your pressure canner but I did want you to know that there is a way to can milk in a water bath. Why Would You Want to Can Milk? There are many reasons… In my case, I just had more milk from my goat than we could drink. I already had enough cheese in the freezer and I work so hard to keep my goats alive (goats are not for sissies! Not where I live at least, they are the most desirable playground for worms around these humid parts…) that their milk is even more valuable to me. I raise La Mancha goats. They go into heat in the fall and birth in the spring. So between October and somewhere around April I don’t have fresh milk from them. I wanted to try to can as much milk as I can to use during those months. 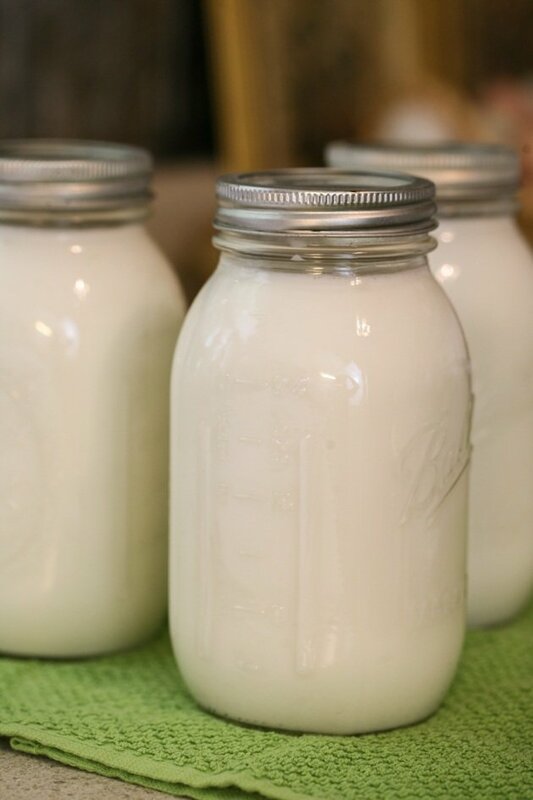 I also thought that it would be great to learn how to can milk so I am not dependent on electricity to preserve it as I would be if I froze it. If you live off the grid, keeping food without electricity is something you are familiar with. But even if you are on the grid, it’s still nice to save some energy, or save room in the freezer for other things, or not needing to worry about food spoiling if the electricity goes out (for example, if you live in areas with many storms and power outages). Another reason to can milk is if you don’t want to need to go to the grocery store often. Some of us live far in the country or are a single person and often a gallon of milk spoils before we can use it all. So canning is a great option. 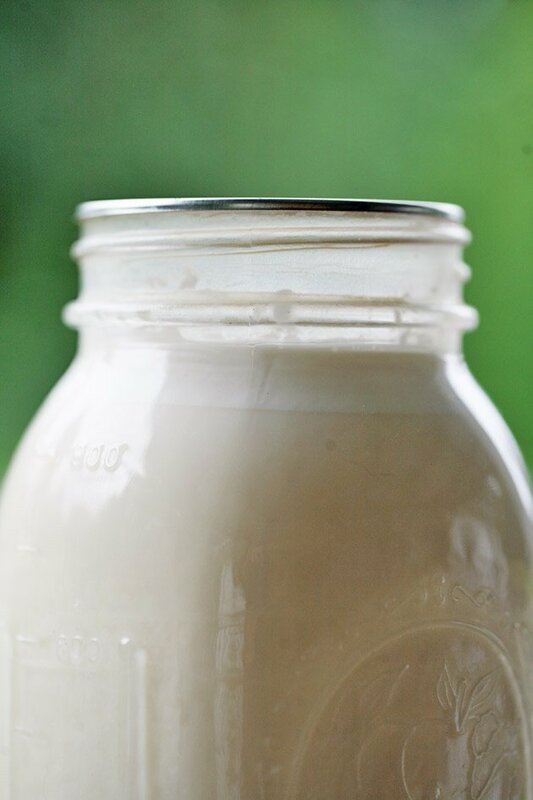 If you are packing for a camping trip, going to spend the weekend at the lake, or going on a road trip across the country, canned milk is a great ingredient to pack. We start by taking the milk out of the fridge to warm up a little bit. Don’t can older milk, the fresher the better. This is my supply from five milking (two and a half days) from one goat. My kids were with their dad over the weekend and I just drink a tiny bit of milk with my morning coffee so the jars just piled up in the fridge. 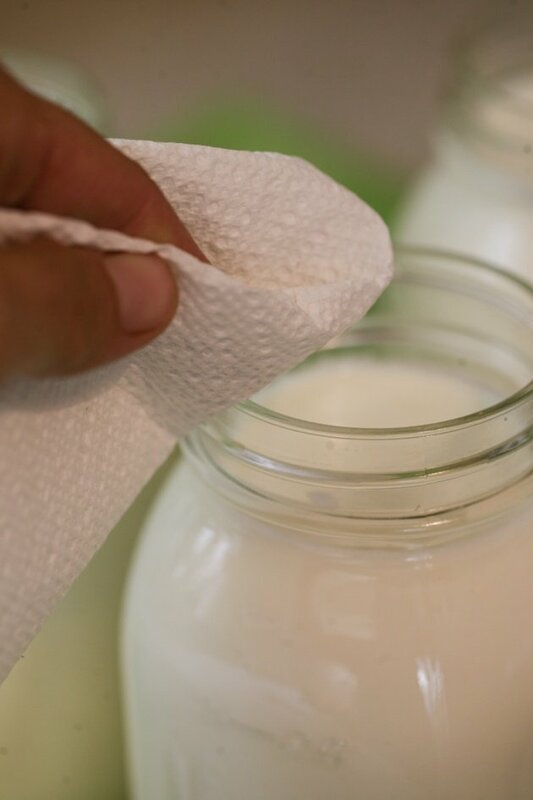 While the milk is warming up a bit, wash your jars in warm water and check that there are no cracks or chips around the rim. Let them dry for a few minutes. Next, it’s time to sanitize your jars. You can do this by placing them in a water bath and boiling them for 10 minutes or so, placing them in the dishwasher, or using the oven. I like the oven method. I place my jars on a baking sheet and heat the oven to 320F. Once the oven is hot I place the jars in there for 10-15 minutes. After 10-15 minutes, remove the jars from the oven and use the jar lifter to remove them from the baking sheet. Place them on a towel and let them cool down. 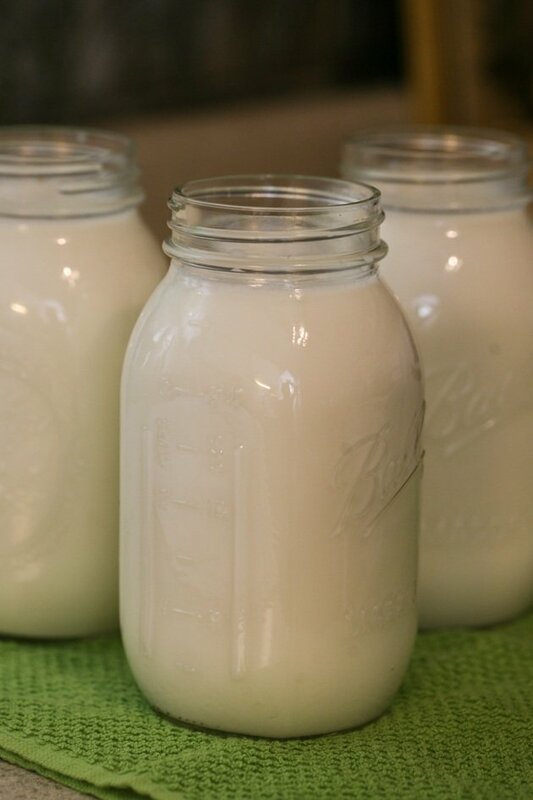 We want the jars and the milk at a similar temperature so the jars don’t break. 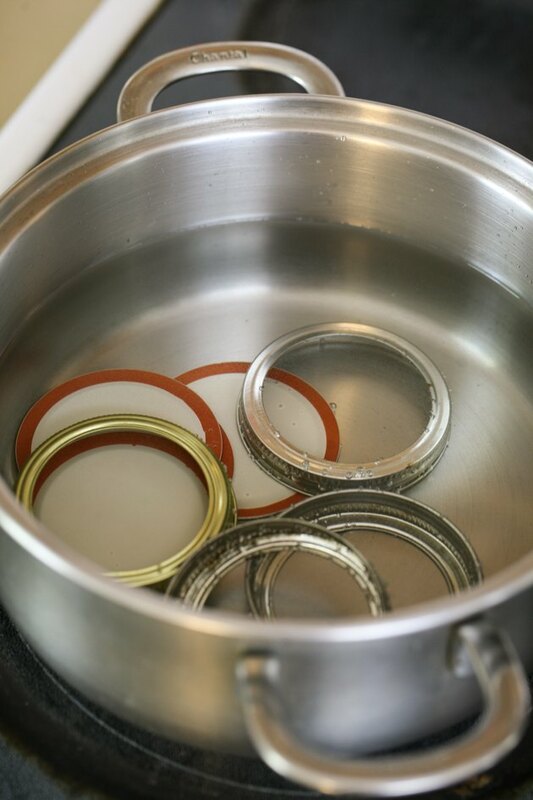 Place your lids and rings in a pot of water, bring to a boil and hold that boil for 5 minutes or so. You can reuse rings but make sure you use new lids each time so that you know for sure that the seal is good. **You can find all the canning supplies I use on my Amazon page HERE. Let’s also fill the pressure canner with some water. I have a Presto pressure canner that I love! You will have to follow your canner’s instructions but if to be honest, I could not find any instructions in the manual on canning milk so I went with 2.5” of water. I also left the tray in there. 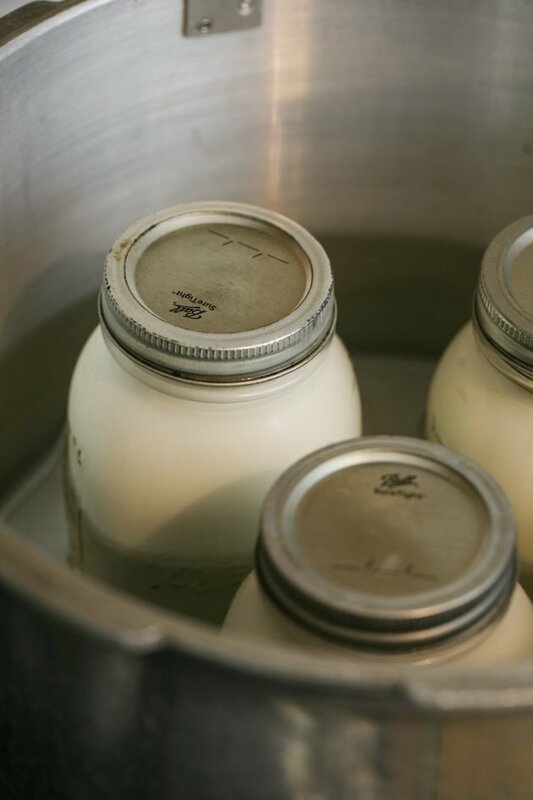 Once the jars cooled a bit and the milk warmed a bit and the difference in their temperature is not too great, we can fill the sanitized jars with milk. Make sure to leave 1/2’’ headspace. Make sure you do not touch the rim or the inside of the jar with your fingers! 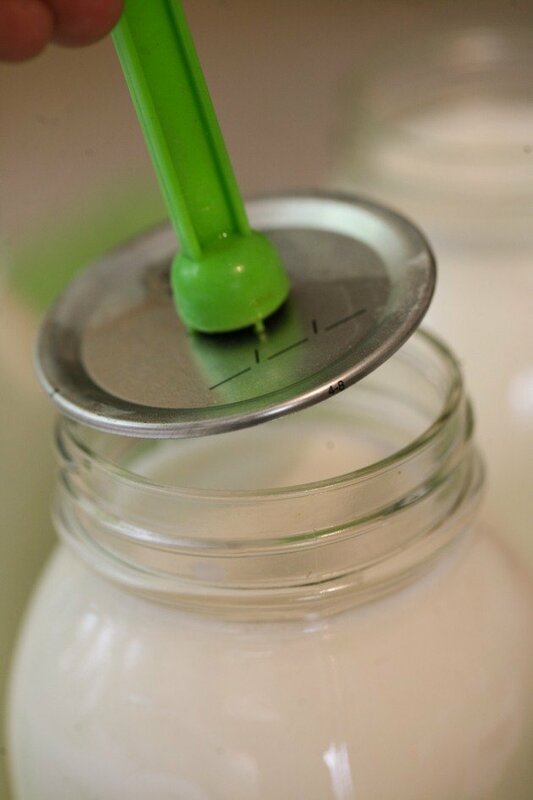 I used a canning funnel to make sure the milk goes in the jar and not all over the place. Use a paper towel to clean the rim of the jar, again, DO NOT touch it with your fingers! 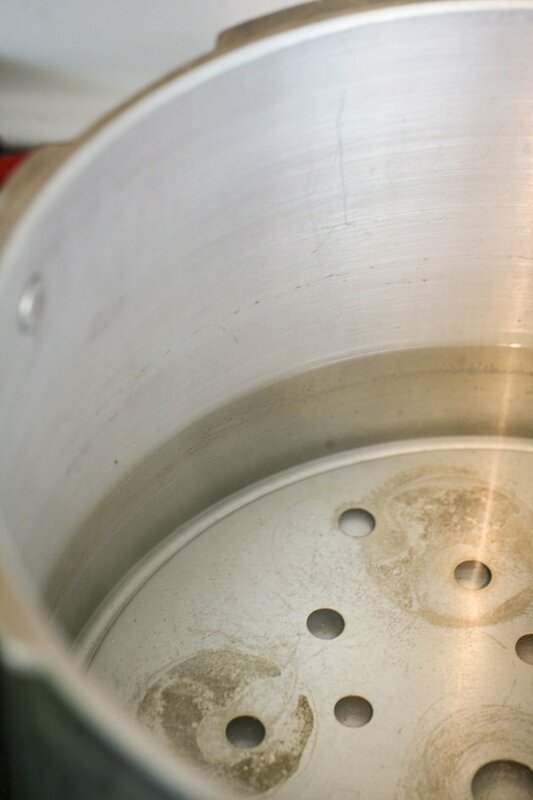 Use the magnetic lid lifter to lift the lid it of the pot of hot water and place it on your lid. Do not touch the bottom of the lid with your fingers. Now, use the ring to close the jar (not too tight, finger tight), and we are ready for processing! 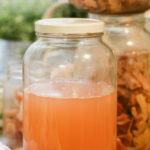 Use the jar lifters to lift the jars and place them inside the pressure canner. Close the canner and turn the heat to high. Now we are watching the little nozzle for steam. It took my canner 18 minutes to reach the point where I can see steam coming out from the nozzle. 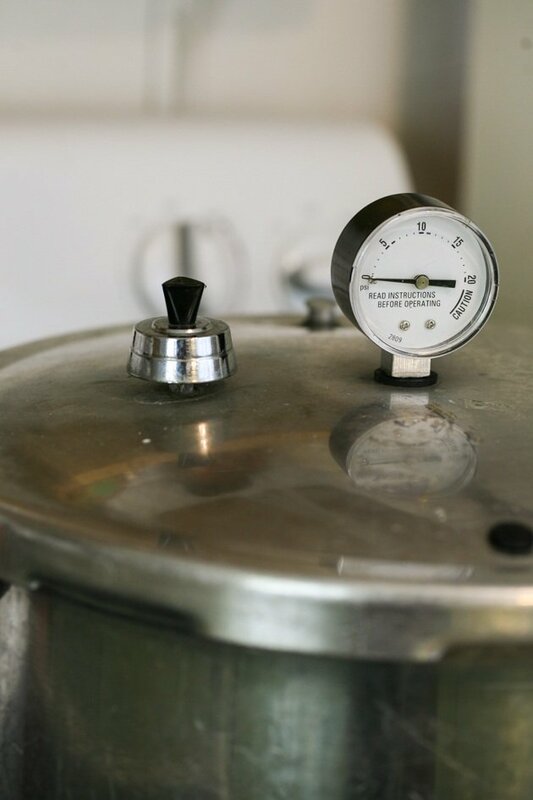 Once the canner starts to steam let it exhaust steam for 10 minutes before placing the gauge on the nozzle. Before placing the gauge on the nozzle. 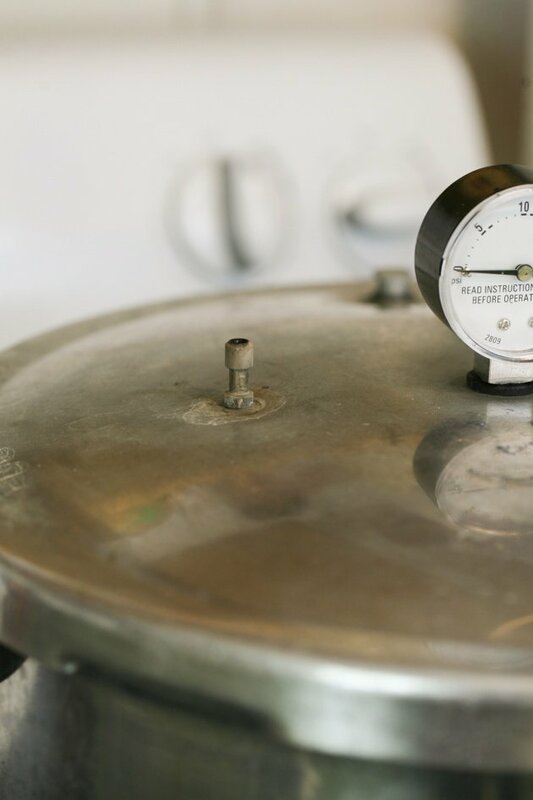 Now watch your pressure gauge, once it showed you 10 psi (it will take some time…), turn the heat off immediately and let the canner cool completely. ** Please make sure to read the manufactures instructions of your canner. This might change a bit from one canner to another. The thing to remember is to turn the heat off when the canner reaches 10 psi. Also, the processing time might change a bit if you live in higher elevations. If you can milk and live in higher elevations please comment below and tell us how long you process the milk. 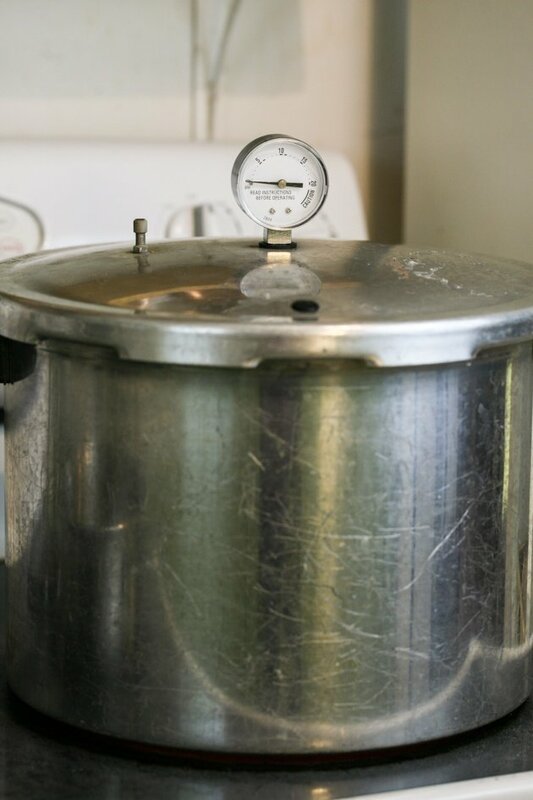 To know if it is safe to open the canner, remove the exhaust gauge and if steam doesn’t come out anymore, it is safe to open the canner. Please be careful when you remove the gauge. 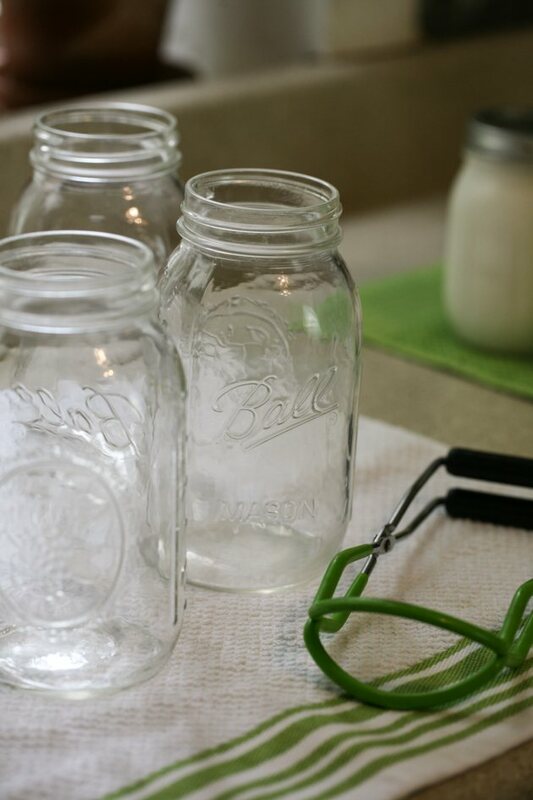 Place a towel on the counter and use your jar lifters to remove the jars from the canner and place them on the towel. Now let the jars rest and cool completely for 24 hours. After the milk has cooled completely store it in a dark and cool place like in the pantry or a kitchen cabinet for example. You will see the cream separating from the milk and that is normal and completely fine. The milk also turns a bit of a yellowish color. It should store for a year or so but I plan to just use it over the winter until my goats freshen again in the spring. It seems like everyone agrees that you can use it for cooking but not everyone agrees with drinking it. Many do though. If you do use it for drinking I think it tastes better if chilled. 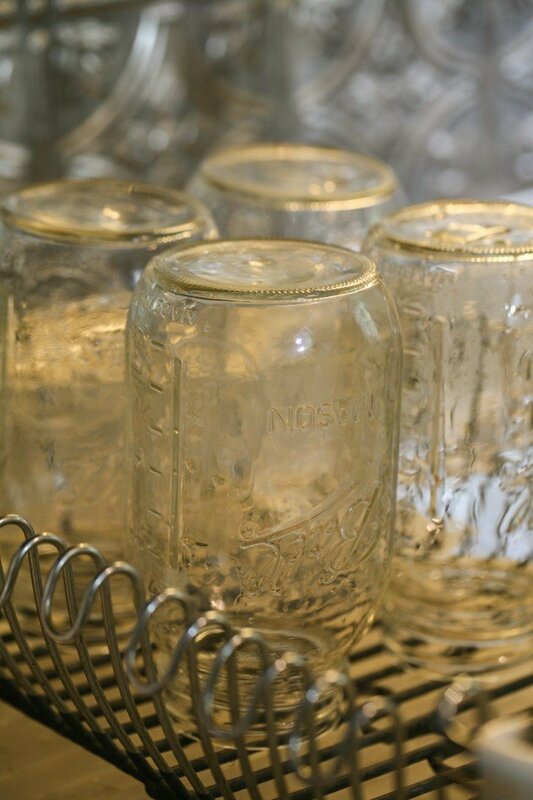 Once you open a jar you do have to make sure to store it in the fridge and use it within a couple of days. 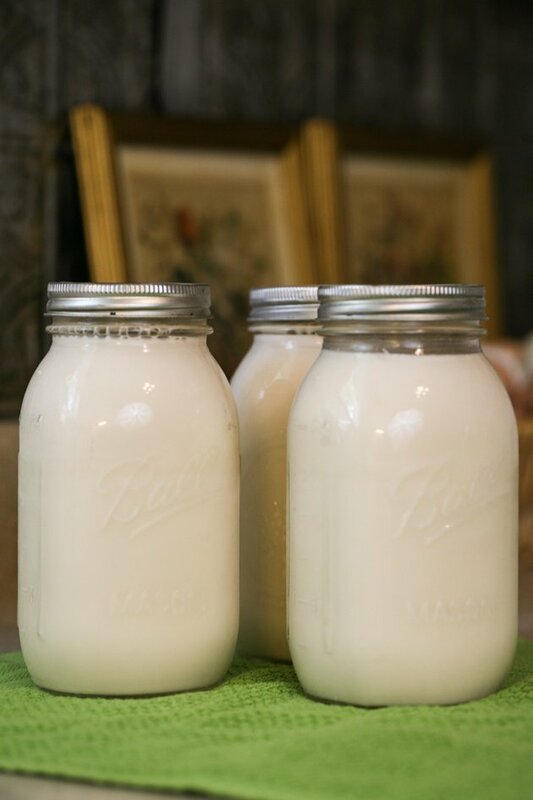 If you’d like to read more about canning milk, my friend Heather from The Homesteading Hippy shares her experience in her post Home Canning Milk via Pressure Canner. If you give this a try come back and let me know how it went, or share your opinions or experience in the comments below. That’s awesome Lee! I don’t can milk myself but I do keep a supply of canned milk in my pantry, mostly for pie making but let me tell you something, I remember old days and war days. I remember rations and drinking canned and powdered milk. 100% of the kids (young adults) today have no idea “at all” what it means to have rationed foods. 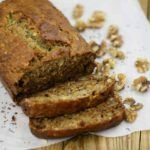 We were a military family and knew we had rations that we could depend on each month….and I remember feeling a bit guilty because we had more than our neighbors had…but we shared when we could. You keep doing what your doing, keep stocking that pantry and learning the “old ways”. Blessings! Sheri, you are so incouraging, thank you! It is amazing how differently people lived not too long ago. How wonderful to find your site! 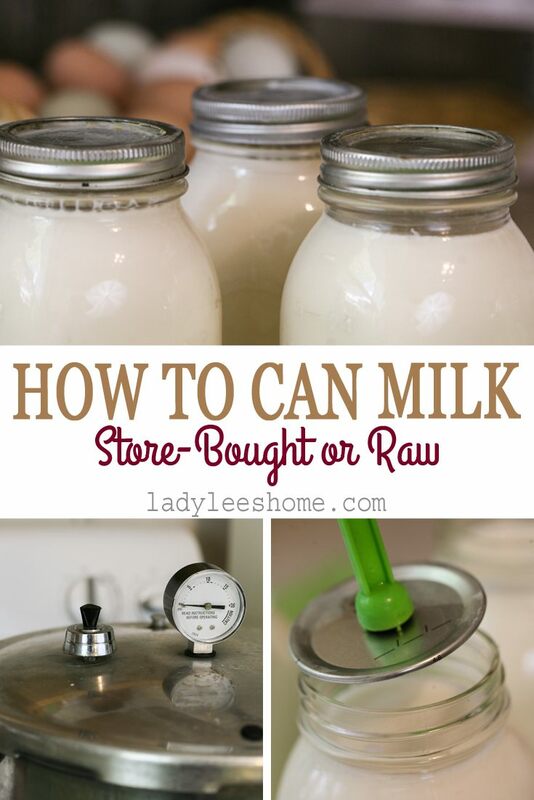 I live in London, England and I have a brilliant source of raw goats milk – Ellie’s Dairy and your clear & concise method of canning it is something I shall certainly try – as soon as I can locate the weight for my pressure cooker! And I, too, am a user of Essential Oils and am fortunate enough to be a client of Valerie Ann Worwood who is the most wonderful Aromeratherapist. Apart from being one of the most knowledgeable people on the use of EO, she saved me from going blind by feeling that the pressure in my left foot was too high. And to Sheri – I wonder if you spent WW2 in the UK? Rationing sounds very English.. as if you experienced it over here as opposed to over there! Thank you Lee for putting together an interesting and very informative website.. like MacArthur said “I shall return”. Thanks for stopping by, Sally! I am happy you enjoy the site. And it’s always great to meet another oil lover! 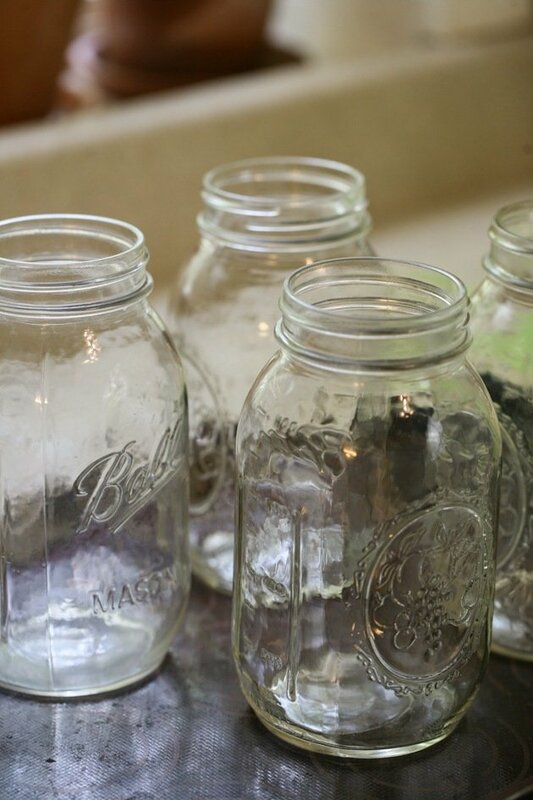 I have canned goat milk in a water bath canner – 90 minutes for quarts. It works fine in recipes but tastes kind of like evaporated milk after it’s canned. My granddaughter used a lot of it for baby goats. The book “Goats Produce 2” suggests that water bath canning is better and we had no problem with it. That is awesome! Because a lot of people don’t have a pressure canner. I didn’t have one for a long time. And it’s a great tip to can milk for baby goats! I had triplets born in the spring and when they were six weeks old their mama died on me! Goat formula is expensive! I didn’t think about canning milk for baby goats. Thanks for mentioning it! 3 years! Wow. I still didn’t open my jars. I am saving them for when my goat is dry. I am excited to try it. Thanks for sharing this! !